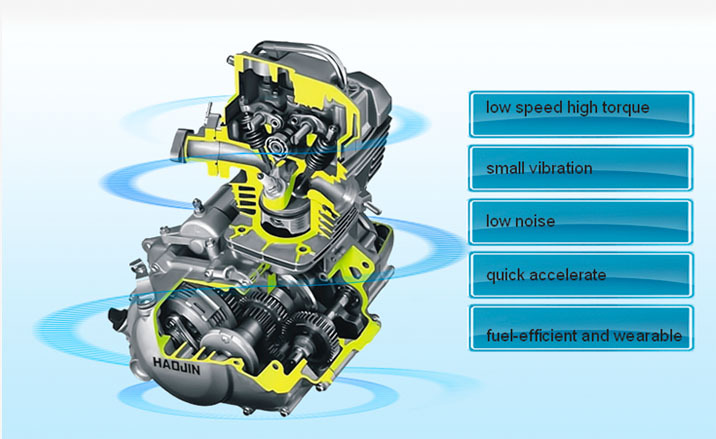 CBF, racing power technology, the latest R＆D achievement of HAOJIN; it accomplishes top 10 core technology with its all-dimensional tech innovation and a conversation philosophy of manufacture; compared with normal engine. CBF is more better on the performance of small vibration and low noise. CBF possesses outstanding characters of low speed high torque, small vibration, low noise, quick accelerate and fuel-efficient and wearable as well as strong power with low speed, perfect durability, with the maximum torque of 12.2N.m/5500r/min and the maximum output power of 8.9kw/7500r/min.